Gabe Stanley, a South African, friend and coach was looking at me. We were on our bikes heading out for a 60-mile training/recovery ride. It was a Tuesday and an easy day. Gabe had pulled off the front so I could take the wind. He didn’t ease back and sit on my wheel. Instead, he rode next to me and stared. He didn’t seem happy. Gabe was a talker. No matter how hard we rode, the two of us, or in a group of 50 riders, Gabe always had something to say and was saying it. At times during a ride it could be irritating, especially when I was sucking wind and he was jabbering as if he was sitting in a club having a beer. On our easy recovery ride, as he peddled his bike next to me; I could sense a lecture was forming. I was hit with his heavy South African accent while he verbally hammered me. “Where are your glasses,” he fussed. Before I could respond, “You have only one set of eyes. Something could blow in the wind and hit one. Something could bounce up from the road,” and on he went with his tirade. It seemed to have lasted for miles. Gabe was seriously a talker. He was also one of the greatest athletes and coaches I’ve ever had the pleasure of calling a friend. His point was taken and soon I was donning my first pair of Rudy Project glasses. It wasn’t long I was also sporting one of their cycling helmets. 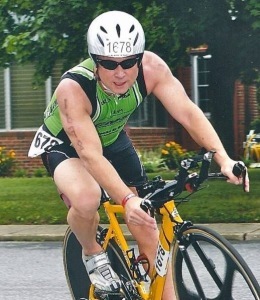 In cycling, running and triathlon I’ve worn Rudy Project eyewear. Today, I can’t imagine doing any of those sports without protecting my eyes and head. Even though I’m not looking to do another triathlon or bike race in the near future I still train and I still use Rudy Project. 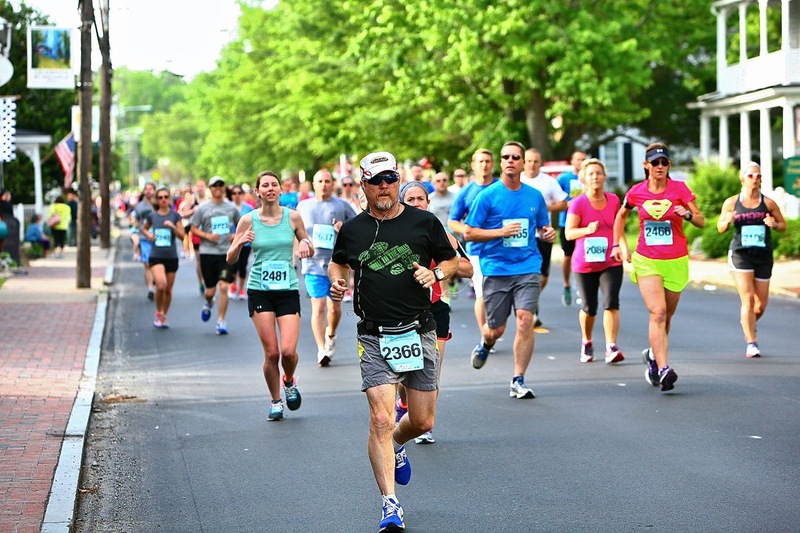 I’m always looking for a run that doesn’t infringe on archery and will, of course, be wearing my Rudy Project glasses on the course. 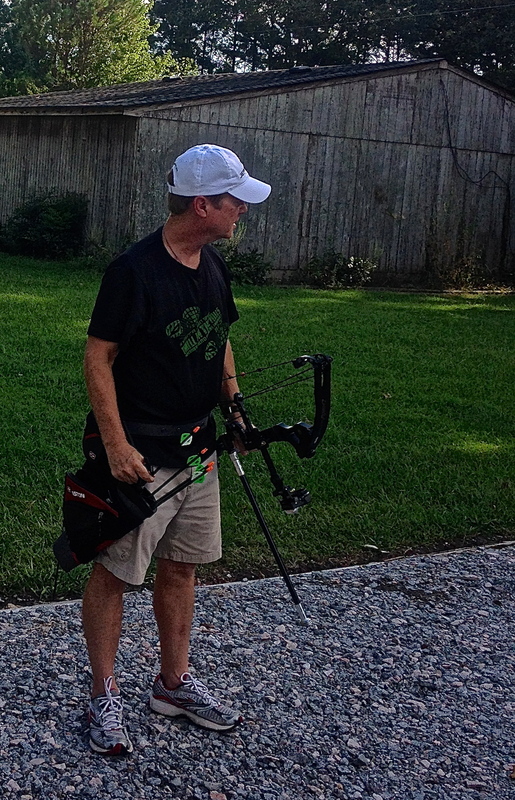 In September 2013 I decided to take on archery as a new sport. 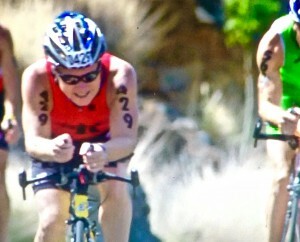 Rudy Project glasses were the eyewear of choice for me. Rudy Project has been around since 1985. It is an Italian company found by Rudy Barbazza in Treviso. In 2003 while bike racing in Florence, Italy, the apparent solo competitor that spoke English (other than me), noticed and complimented by Rudy Project glasses. Treviso is about 175 miles from Florence. It would have been cool to have visited the mother-ship while I was in Italy, but there was not enough time. Barbazza, with the onset of his company’s vision sought to create the world’s most technologically advanced sports eyewear. He and his team have worked with athletes from all fields, listening to what they want and what they need. Their goal has been to find the most advanced materials to develop products that elevate an athlete’s performance. They’ve summed up their research and efforts in two words: Technically Cool. Shortly after I picked up a bow and started my project of talent transfer I contacted Rudy Project hoping to get them as a sponsor. From that first official contact I have represented their products. It was cool to wear them, even cooler to be one of their athletes. Aside from the obvious advantages such as protection from wind, dust and insects, which may adversely affect the vital concentration of an archer, there is one major impact – light. At my first ever NFAA Field Archery competition (NFAA Sectional Championships. June 11th – 12th, 2016) we’d be shooting from light restricted forests to bright open fields. 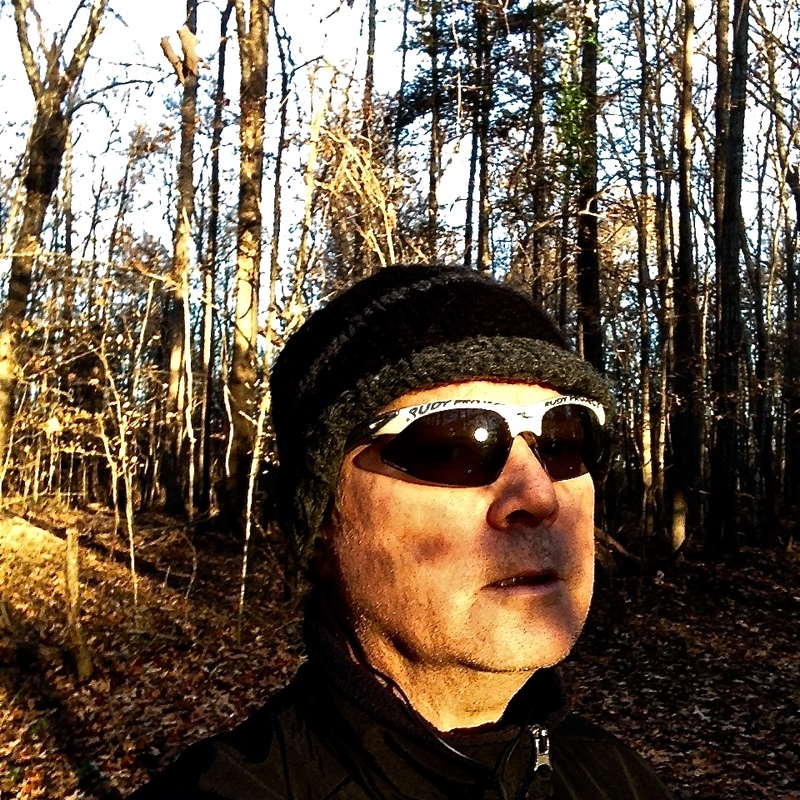 It was so bright when we’d emerge from the woods that without my Rudy Project glasses I eyes would have been watering. Fortunately, I hadn’t left the glasses in my truck (It’s happened) and I shot well enough to have earned a 3rd place finish. If you are an archer trying to get sponsorship, you know the difficulty. I may have had a slight advantage when I contacted Rudy Project because I’d done well on other sports as an amateur. The company did take a chance by agreeing to support a true novice in archery. There’s still a long haul ahead of me before I start earning more money shooting. 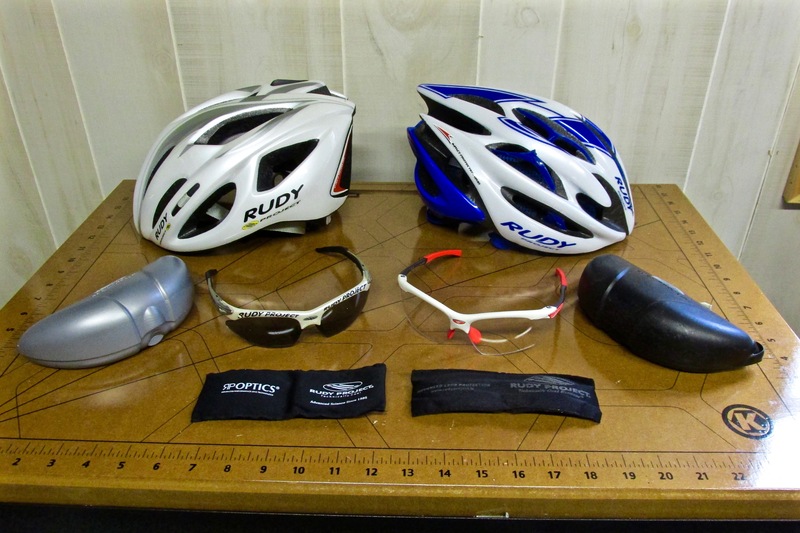 But, I am happy to have Rudy Project behind me – or, to be specific protecting my eyes and head. Gabe, rest his soul, would be pleased. This quarter has been a frustration – no wins. I competed in 8 events. Six in archery and two were bicycle races. 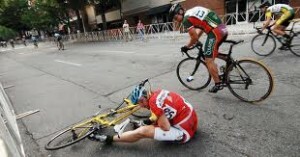 Yes, doing a bicycle race was a bit risky. 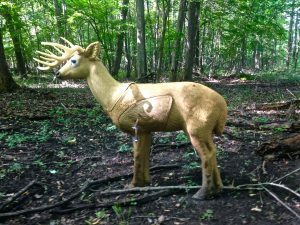 A crash could wreck an archery season. Both bike races were time trials so odds of a crash were low. The cycling races yielded two-second place finishes. The Maryland State Championship was also the IBO World Championship Qualifier. My 2nd place qualified me to compete at the IBO World Championship. Two archery events I’d planned were canceled because of storms. The NFAA Sectionals messed me up for the Xterra Triathlon. I was competing in the sectional that ran long infringing on the triathlon – both were on the same day. The archery in the morning followed by the triathlon in the afternoon. 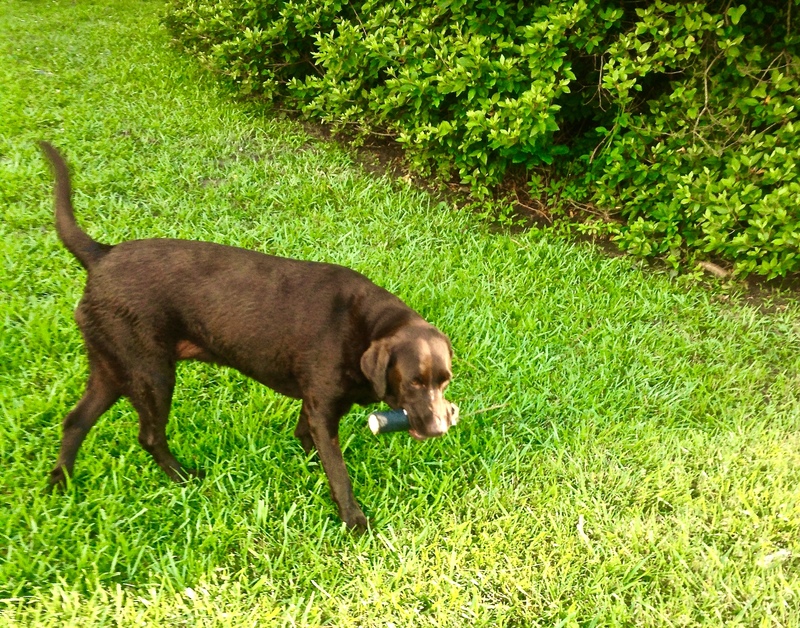 An afternoon triathlon – an Xterra – would have been very cool. 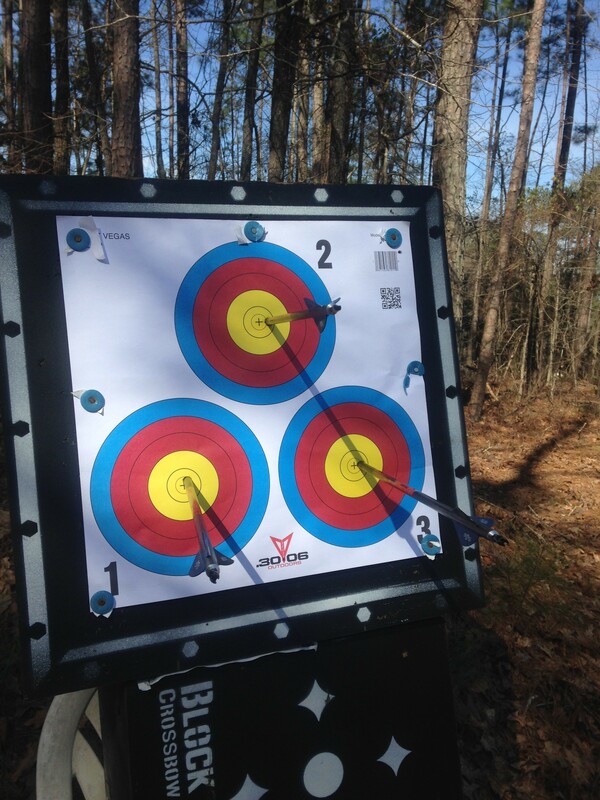 As it turned out I had to be satisfied with the 3rd place finish after the 2-day sectional competition in archery. I’ve been on the road a lot having traveled 2490 miles this quarter to compete. I am looking forward to some time back home before heading out to the IBO World’s. The website, Puttingitontheline.com, where I post remains strong. During Q2 it had 32,860 visitors in Q2 who read 84,567 pages. It also has a new logo. 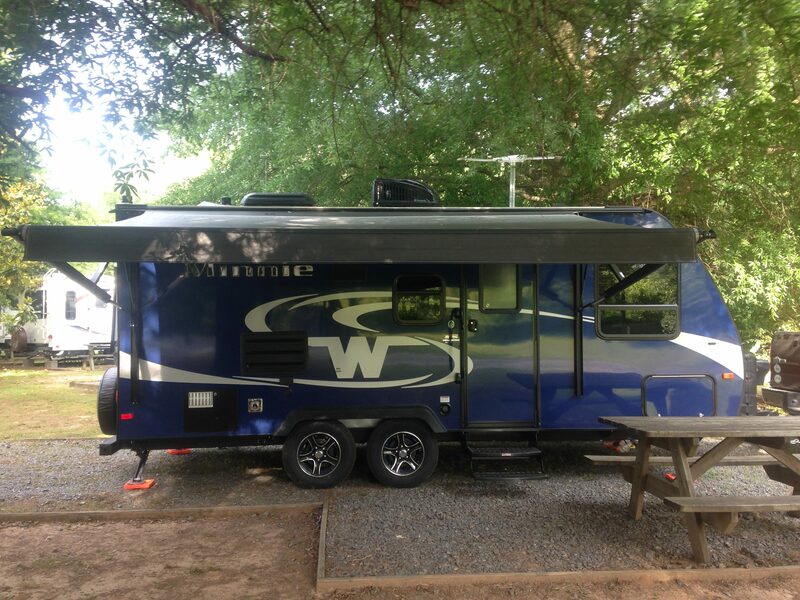 To reduce costs (based on a three year ROI) we bought a Winnebago. For example, the past 25 nights on the road cost $592.00 using the Winnebago (lodging only) whereas hotel and kennel fees would have been $4,520.00. That’s pretty much it for Q2. It was a long shot – no doubt. The NFAA Sections ran on Saturday and Sunday in Stoneville, NC. 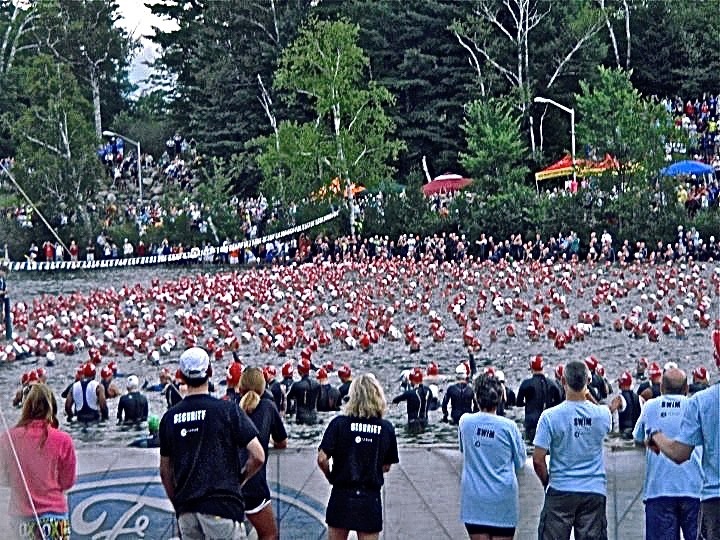 The Xterra triathlon was scheduled for 4:30 PM on Saturday. Both events were on my calendar. The archery tournament and triathlon were only 45 minutes drive apart. The field archery event, according to someone on the phone, was expected to be competed, the Saturday portion, by 2 PM. This was doable or so it seemed. I stayed at Dan River Campground. 15 minutes from the tournament and 30 minutes away from the triathlon. Saturday we shot 126 arrows. At 12:30 PM we’d only fired off 56 shots. The triathlon was becoming a questionable race. 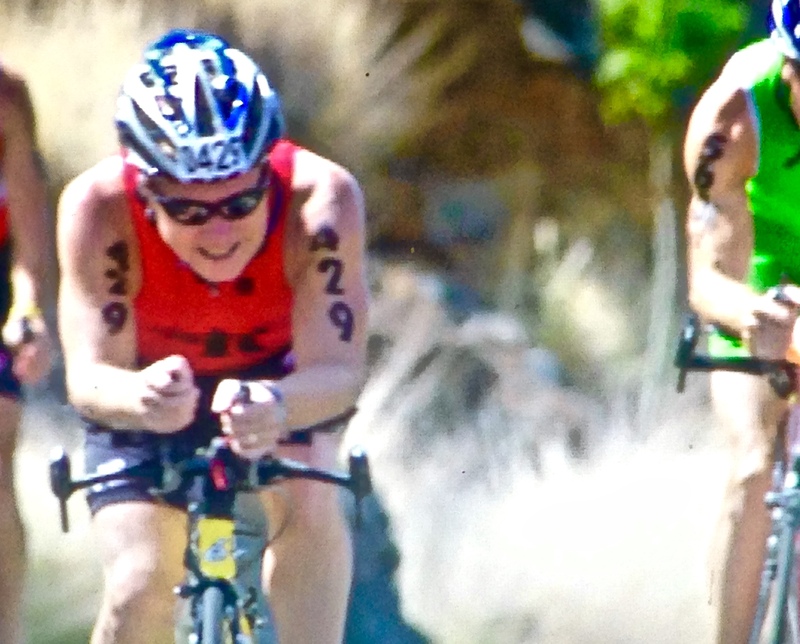 An Xterra triathlon means a swim in a lake, a mountain bike race, and a trail run. Something that seemed just about perfect. The bonus is that it started in the afternoon. That alone was a novelty. It was going to be really a cool race despite the 95-degree temperature. One thing that could happen was to walk away from the field archery sectional. 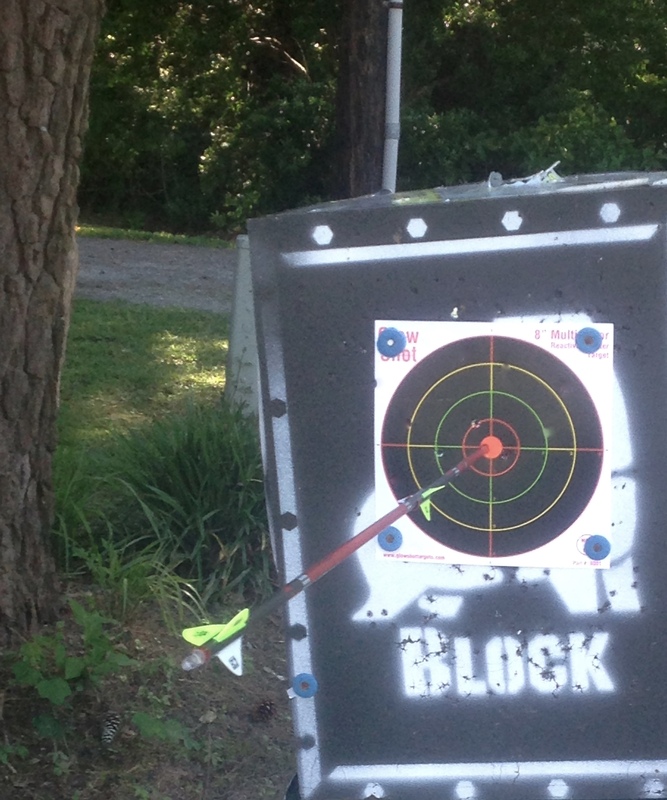 By 3 PM, it was clear, archery would be the only competition for last weekend. There was no way I was leaving the tournament. As so the day ended with archery only. The tournament wrapped up at around 6 PM on Saturday. It was a shame but there was nothing to be done aside from walking off the course to compete in the triathlon – which I didn’t do. I’ve never competed in a “Field Archery” tournament. I’ve never done an “off road” triathlon. This weekend that will change – if all goes according to plan. I’ve shot in a lot of archery tournaments in less than 3 years. Forty-eight at last count. But, never one of the NFAA type tournaments. I’m not real sure what to expect. I tried to read the rules and searched field archery on Youtube for a bit of education. Both efforts failed to provide a wealth of assistance. Well, I had a dozen new arrows for a minute. Hope I don’t need more than 10 this weekend. 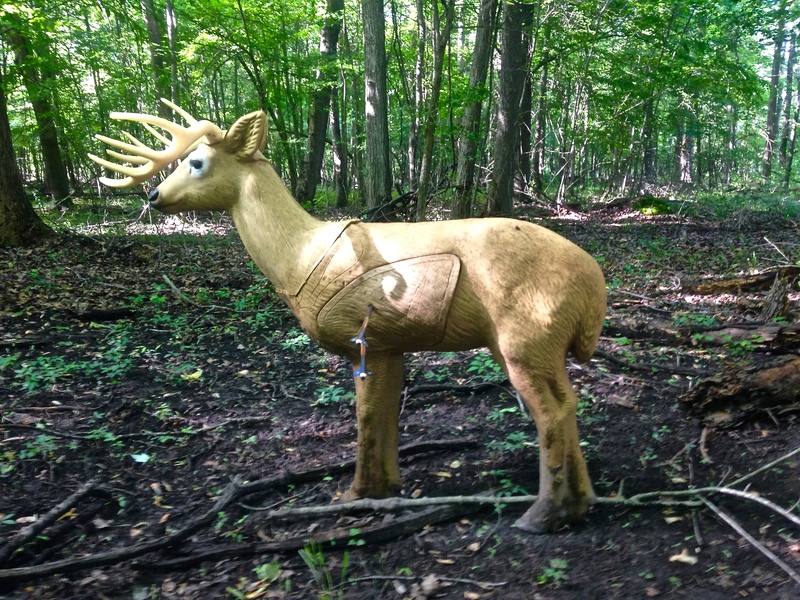 One thing I noticed is in field archery targets are out to 80 yards. That’s a long shot and I did practice at that distance this week. The archery competition also two days – Saturday and Sunday, or so it seems. Honestly, I am not sure. I imagine this weekend will be enlightening. The other new thing is an Xterra triathlon. The scheduling will be tricky. There’s not an abundance of time between when I expect the archery to finish on Saturday before the triathlon begins. Archery finishes around 2:00 PM and I need to be race ready by 4:00 PM. Tight. It’s a rare triathlon that starts in the afternoon. I really hope I can make it on time. 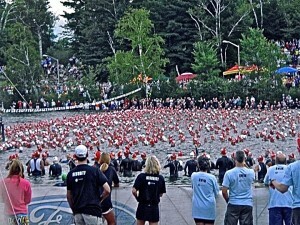 Racing in a tri that doesn’t start at the “puke of dawn” is a bonus. 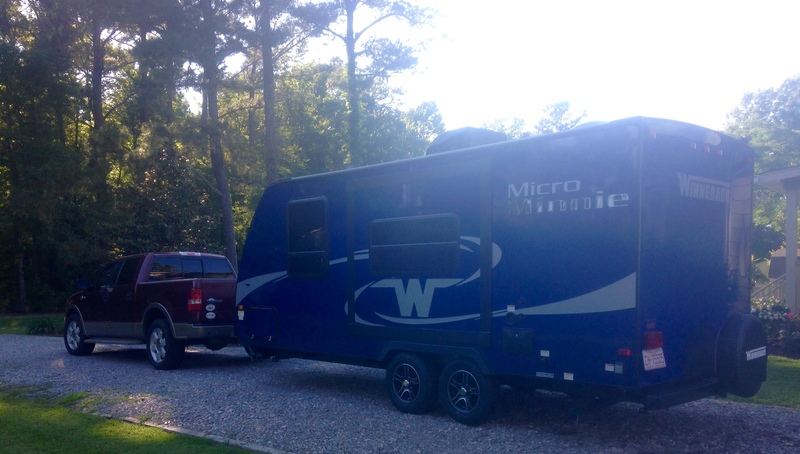 Either way, the Winnebago is ready to go. This weekend there’s a two-day field archery tournament and a triathlon. I’m entered in both events. It’s going to be a stretch making both of them, but it’s worth a try. With the triathlon in mind, I’m tapering a bit. The race is an Xterra sprint. That means a short swim, only 800 yards. 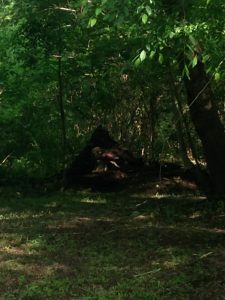 The swim is followed by a 14 mile off road (mountain bike) ride and finishes with a 5K-trail run. The swim is, well just that a short swim. The distance is par for a sprint triathlon. 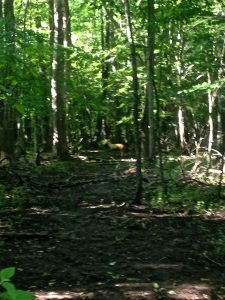 The mountain biking and trail running are different for me. I’ve done both and did pretty good in mountain bike racing and was okay as a trail runner. But, I’ve never done an off road triathlon. I’m looking forward to it. It is going to be tight. The archery tournament is a two-day event. The finish time for the tournament is approximately 2 PM on Saturday. The triathlon, 45 minutes away from the archery tournament, starts at 4:30 PM. However, check-in ends at 4:00 PM. It’s very cool to be doing a race starting in the afternoon. Most start around 7:00 am or earlier. I hope I can pull it off. Tapering for the race means little for a sprint. I still swam today and ran. But, not as far as usual. Short for the swim means I only swam 800 yards. I’m not a fast swimmer and it took about 14 minutes to go the distance. I also ran slower than usual simply enjoying an easy pace. Archery was also a little easier. Yesterday I shot for about 5 hours. Today, I practiced only two and a half. 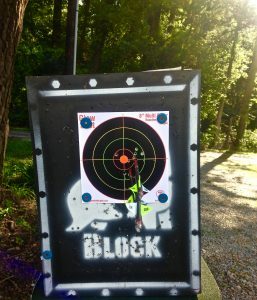 I practiced for a while shooting at paper out to 60 yards. I went out to 80 yesterday. 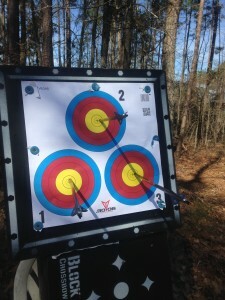 In order to get an 80-yard shot I moved my targets, used a 100-foot tape measure and reeled out 80 yards – marking at 30 yards, then 60 yards and finally 80 yards. I ended up two doors down on my road and practiced shooting from one of my neighbor’s front yards. I shot across his property, the house between us onto the target in my driveway. There’s only two families here full time, including us, so it wasn’t a problem to shoot across the middle lawn where there’s a currently vacant house. Today, 60 yards was enough. Since I’ve changed arrows for the field tournament and the USA Outdoor Nationals I am having a bit of a problem getting a yardage tape that aligns with the calibration on my sight. The yardage marks are good out to 35 yards, but beyond that everything is off by 2 to 3 yards. It was also a day for 3D practice. The range has gotten very thick with foliage. It will need to be trimmed this week. Parts of it were too wet for running shoes, which I was wearing at the time. We’ve had a lot of rain here over the past few days. Tomorrow, it will be rubber boots in order to keep my feet dry. River was a big help throughout practice. She seems to have learned a new trick. What she does is goes swimming. She then leaves the water and stand near me as I prepare a shot. 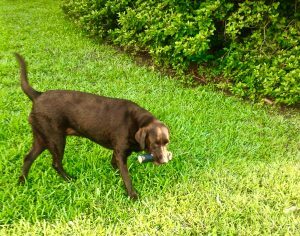 Once I’m at full draw she shakes the water from her coat. Neat trick. 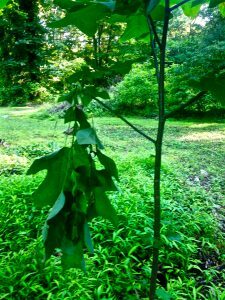 Struck this branch with an arrow on the way to a bear. Couldn’t believe I still hit the target. Swimming was my primary focus for today’s cardio training. Since it’s been raining non-stop swimming at the YMCA was perfect. Then, it was onto 3D or indoor archery depending on the weather. I have a triathlon in a few weeks. My goal for this workout was time. I did a swim time trial for the distance I’ll be swimming in the June XTerra triathlon. The distance is not an issue. What I wanted to know is how slow (or fast) I might be over the 800 yards (sprint distance) for the triathlon. Whatever time I have the in pool it will be faster than open water. 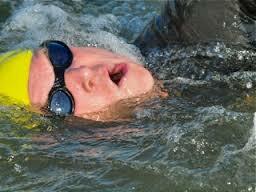 In open water it’s harder to keep a straight line. I tend to zigzag from buoy to buoy. Heading back to my Ford F-150, after the swim, I was pleased to see it had stopped raining. Not really wanting to shoot indoors I knew I’d be on the 3D range soon. I’d recently gotten a new 3D target, a bobcat, and was eager to stick some arrows into the small cat. 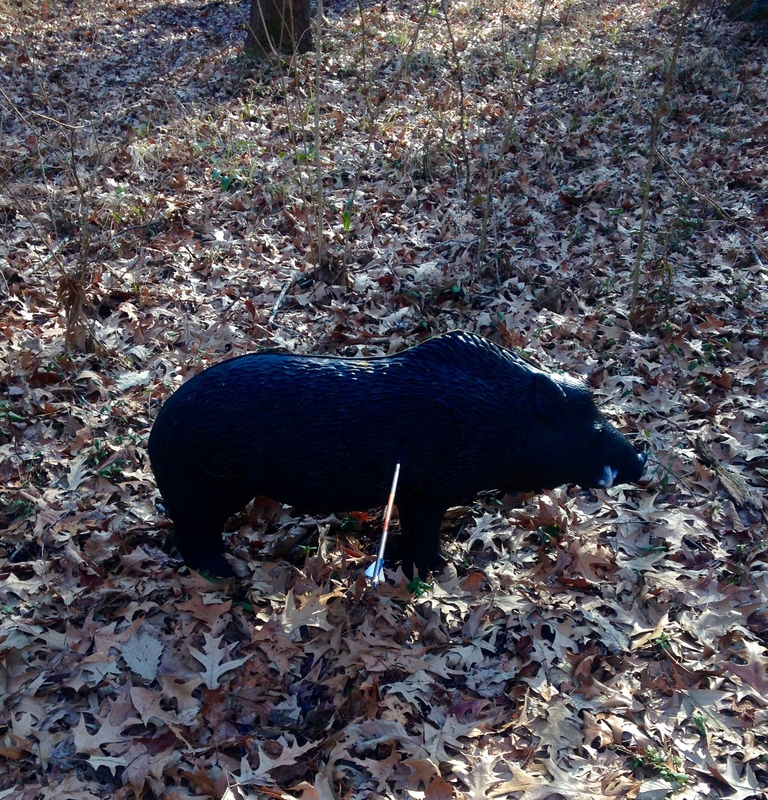 Before I got to my new target I spent time shooting a bear, badger, coyote and turkey. Progressing through the range, I was anticipating the new animal. Shooting the same old targets day in and day out is fun, but a new target is exciting. The bobcat is certainly a small target. Where it’s placed on the range the maximum distance it can be shot is 32 yards. That seemed like a good place to start. The rings on the bobcat are barely visible using binoculars from 32 yards. This wasn’t a freebee shot. The cat sits so that it’s in a tunnel of foliage. From the stake, which is in the open, the shot enters a closed in path. This was done in an attempt to make the shot more difficult. I’ve seen bobcats similar to this one during tournaments. Each time the faux Lynx rufus was sitting straight down a lane less than 20 yards from the stake. 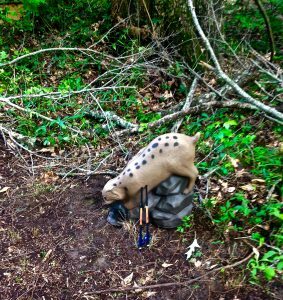 Granted, it is a small target and during tournaments small targets are frequently arranged less than 20 yards from the stake. Small targets aren’t always so close. 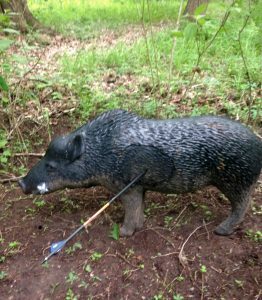 The last few javelinas I’ve had to shoot in tournaments were at 40 plus yards. I silently cursed before I took my shot. My inaugural shots on the bobcat were a ten and an eight. The eight was the first attempt. 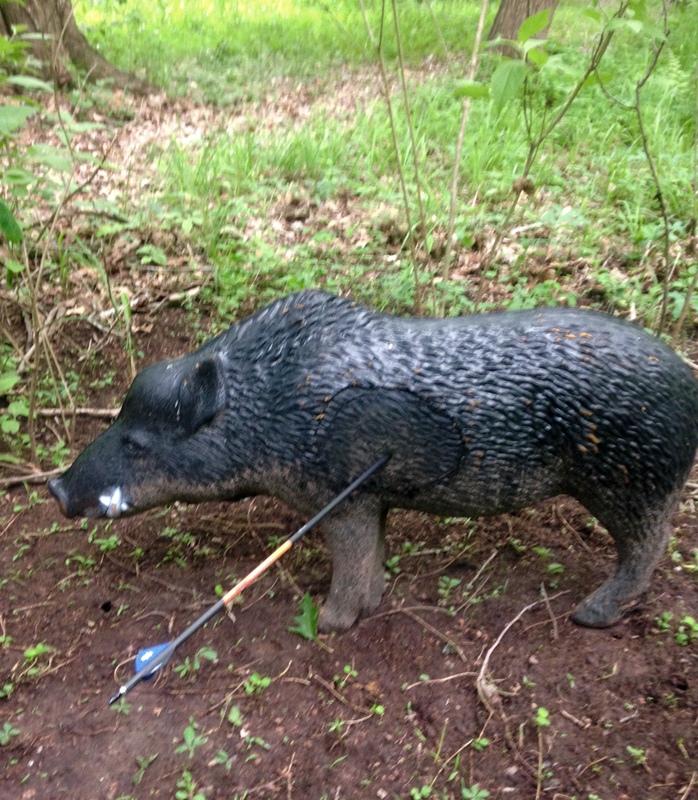 I tried a few more times to hit the very small center ring from 32 yards – never got it and moved onto the next animal. Where I wanted to spend some time was on this pig that is situated so that trees and angles make up the challenge. 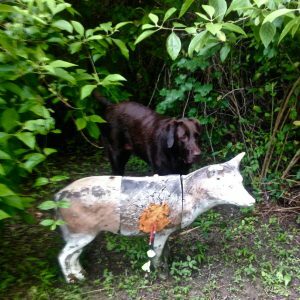 I have three stakes for this pig. There’s not much different where distance is concerned, two shots are at 37 yards and one is at 34 yards. 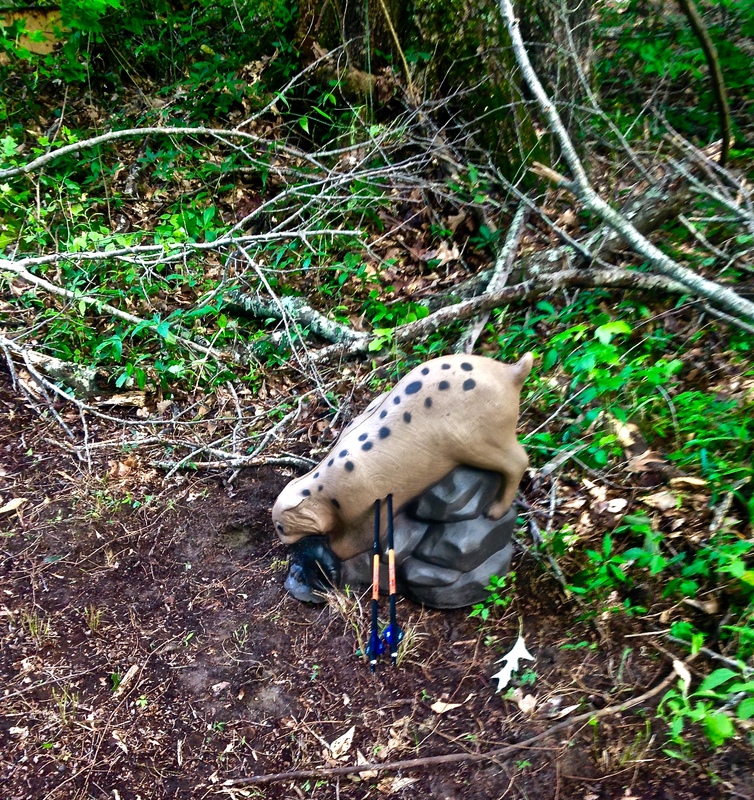 The trick is to get the arrow between the trees and hit the pig on a slant for the longer shots. 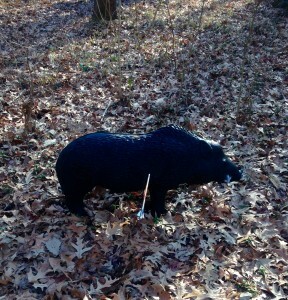 At 34 yards the shot is nearly straight on. 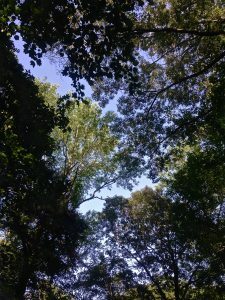 What’s happened, as summer approaches (come on warm weather) is that the foliage in the woods has darkened everything. The black boar’s rings are impossible to see. Shoot it enough and maybe the rings can be committed to memory. 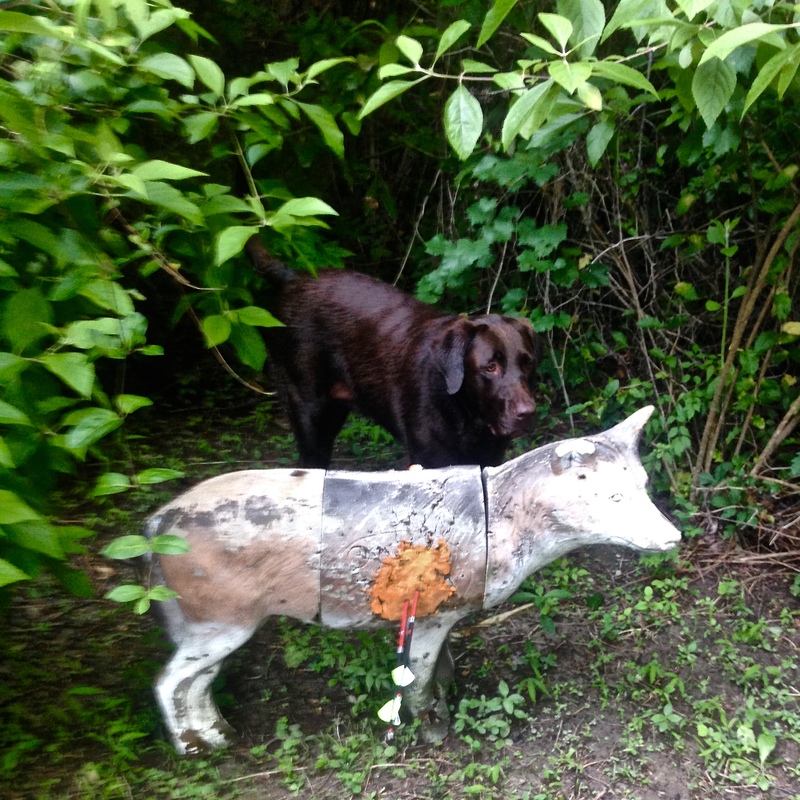 If only all the pigs I see in tournament were at 37 to 34 yards and the size of this one. 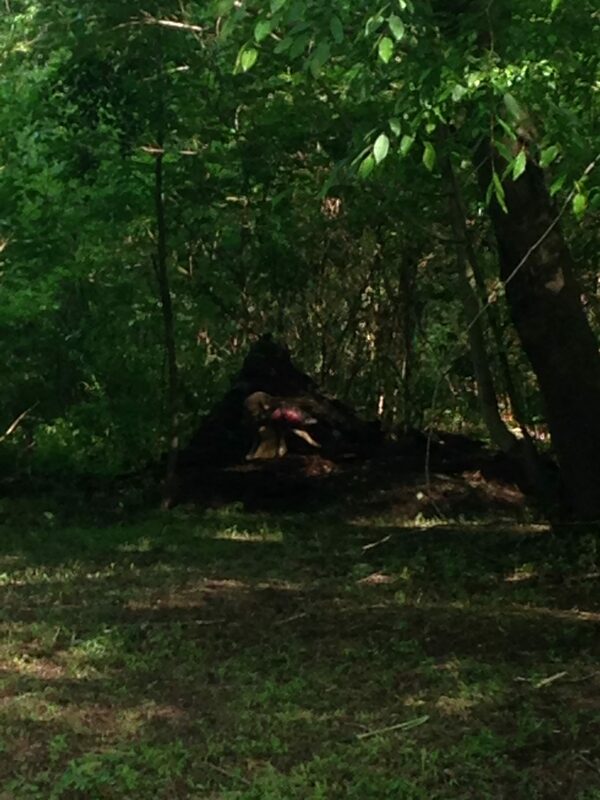 Practice kept me in the woods for around two and a half hours this afternoon. Not a bad way to spend an afternoon. 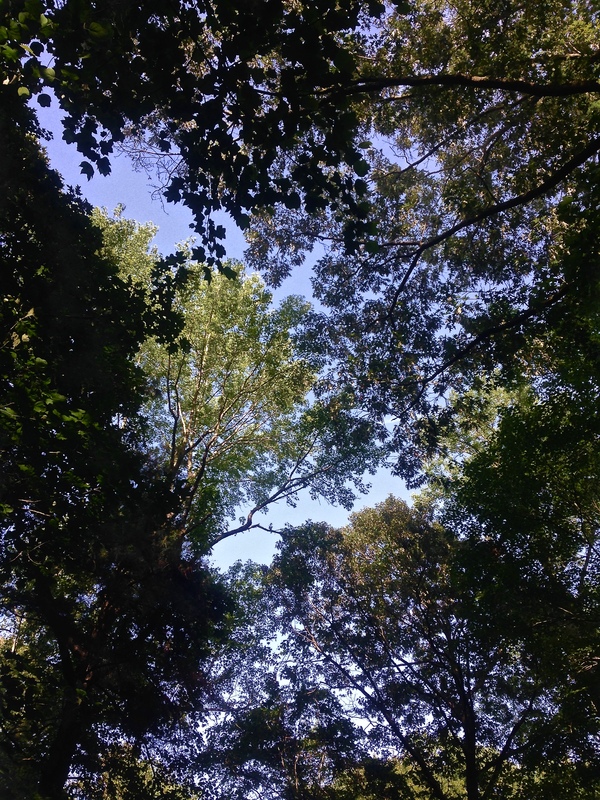 The lighting in the woods because of leaves gives this forest a very different appeal than the bare trees of winter. It sure beats sitting in an office. If you read this website, you know it is not exclusively about archery. 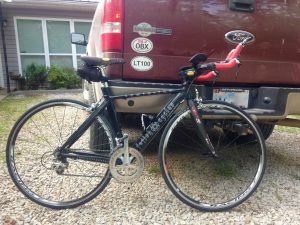 Among the posts here are writings about running, cycling, swimming, and triathlons. 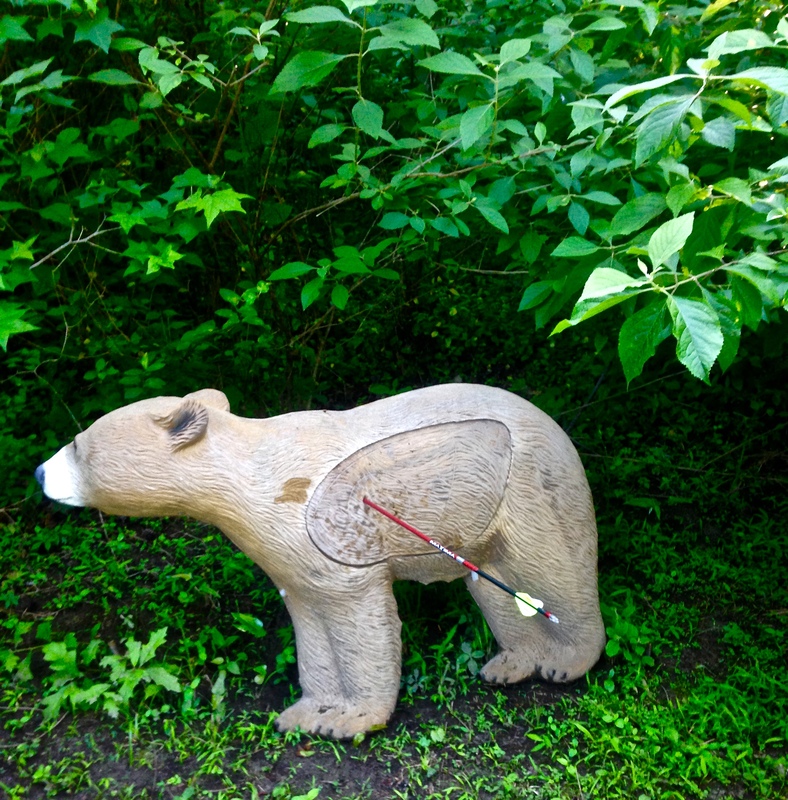 Yes, archery is the major topic – it’s the ambitious experiment with a study population of 1. Regarding archery as an experiment, well in a manner that is exactly what the sport of archery is providing me. Using whatever training, science, and psychology available I wanted to see whether I could be successful as a competitive archer. The archery experiment has been underway for 34 months. 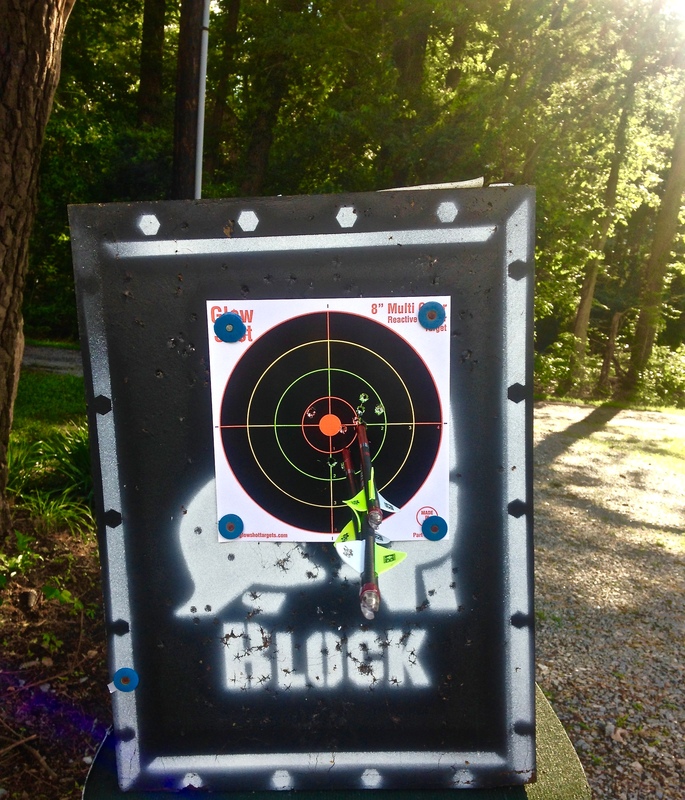 As such, 34 months ago I shot, for the first time, a compound bow. The study remains inconclusive. Archery is also a competitive fix satisfier. I love to compete. I love sports. I have zero natural talent. I am somewhat short (5’8″ and shrinking) and slow. Nevertheless, I been fairly successful in long distance sports. I do understand a lot of the science around sports. I’ve used what brains I have to help compete against athletes that exceed my brawn. Sometimes it worked, many times it didn’t. In either case, I had some fun. When we moved to our home in North Carolina there weren’t many local endurance races. I’d bought a bow on an impulse and was soon hooked shooting. It is easy to understand why there are so many archers – it is very addictive. And, even a talentless retiree could hit a paper target with practice. However, my need to race in endurance events remained strong. I have no desire to go after an Ironman; I’ve done plenty of them. Any triathlon would satisfy. The ones available were long drives away, expensive, and nearly always interfered with an archery tournament. Not yet ready to give up on endurance sports I’ve continued to do moderate training in the, what seemed, unlikely circumstance that there was a run, ride, or triathlon nearby – at least in the State of North Carolina. The training, in my opinion helps with archery. In the past, and currently, I’ve traveled a lot to compete in sport. I’ve raced or trained in Europe, Japan, Asia, nearly every US State including Hawaii, and Australia. Most of this was associated with travel where I was not footing the bill. Today, I have to pay to play. 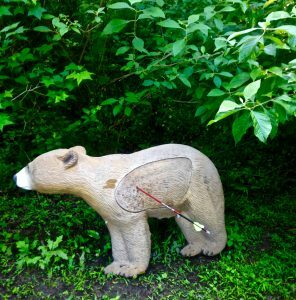 Believe me, archery is a lot less expensive than an Ironman and the travel is more humane. 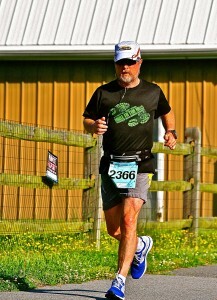 Still, it was sad that there did not seem to be a lot of endurance events anywhere near where I live in North Carolina. True, there are a few races over on the Outer Banks. I’ve done them several times. Locally, there was zippo. Then, by chance, I found the mother load of endurance racing on a website for North Carolina. What a relief. 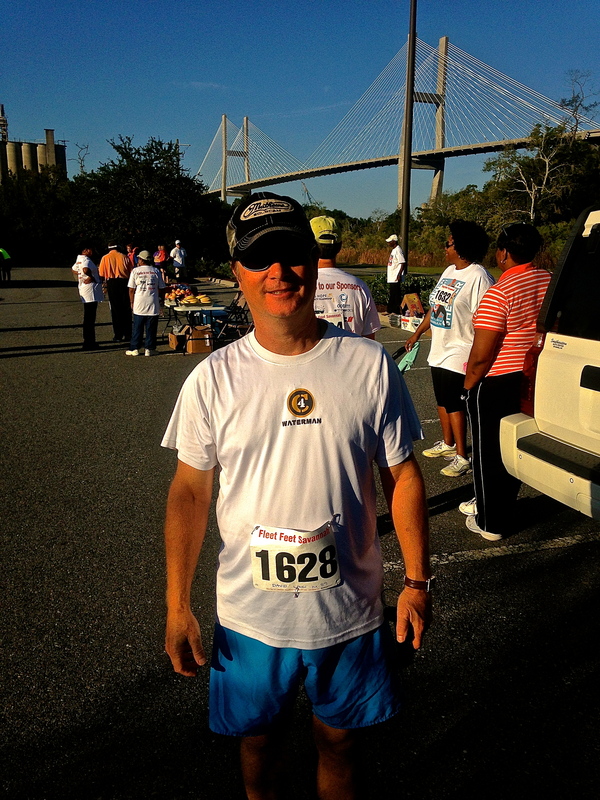 I was so disparate for an endurance race I was considering running an Ultra-marathon, a 100-mile run. The distance isn’t so much of a worry, the boredom is the obstacle. Since I found the races I’m already planning one race per month through November 2016. If I have a weekend that hasn’t been filled with an archery competition, well I’m racing. Heck, I am considering another Ironman for 2017. Happy days are here again. There’s a long course duathlon and XTerra Triathlon on my near calendar. There are three other triathlons and a running race as well. But, the duathlon and XTerra events are next up, aside from archery. The two recent cycling time trials left my legs a little weak. A day off while I drove to Georgia, the day following the last race, was my official rest day. Since we landed in Tignall I’ve run and ridden every day. 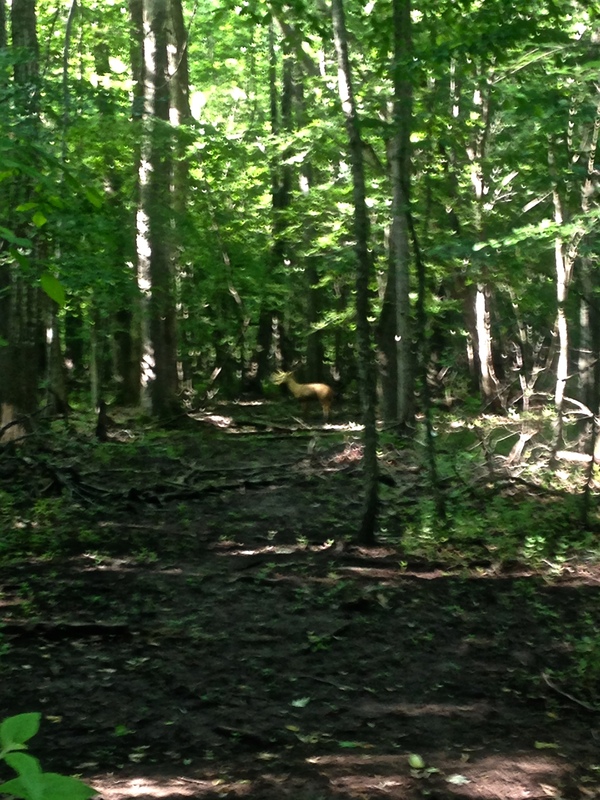 The last two days were bricks, off road – that is trail running and mountain biking. (An example of a brick is where you run and after completing the run training you begin your cycling training. It could also be a swim followed by cycling.) This evening while making dinner my legs felt a little wobbly. It’s not a bad feeling; it’s that leg shaky ache earned when you’ve been putting in a lot miles. Riding off road in this hilly section of Georgia has been a blast. Not crashing, I’ve not been on my mountain bike since my last trip to Georgia, is a bonus. 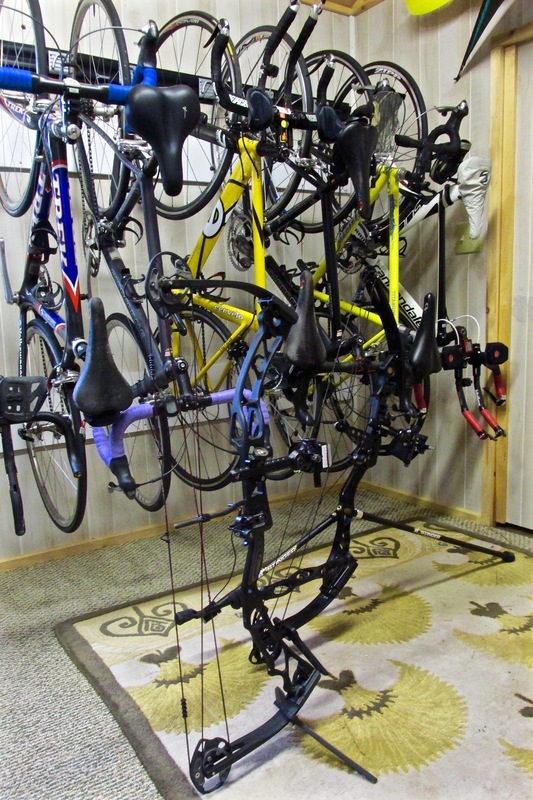 Because the riding has been off road I’ve been standing on my pedals a lot, keeping my rear off the bike’s saddle. There are times when riding in that manner is critical and it can add some extra burn to your thighs. 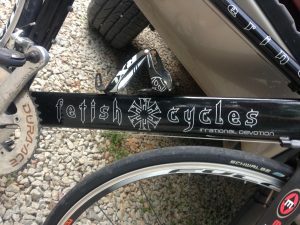 I keep one tri-bike, my Fetish (The bikes brand name not a carnal preference) along with a Cannondale F-5 and Scott mountain bike. 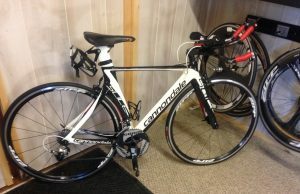 The Cannondale is the bike coming back to North Carolina for the XTerra race. Hopefully, by the time that race starts my mountain bikes skills will have returned. Until then, I expect more shaky legs from much standing off the saddle while cruising trails. Last night the wind had picked up, again. This morning trees were bowing to the wind’s force. This was the morning to practice archery indoors. I’d planned to shoot inside on Thursday. Plans can be amended so I headed into Elizabeth City to practice. On the range I ran into Charlie. He’s a retired Naval Officer that settled here on the coast of North Carolina. 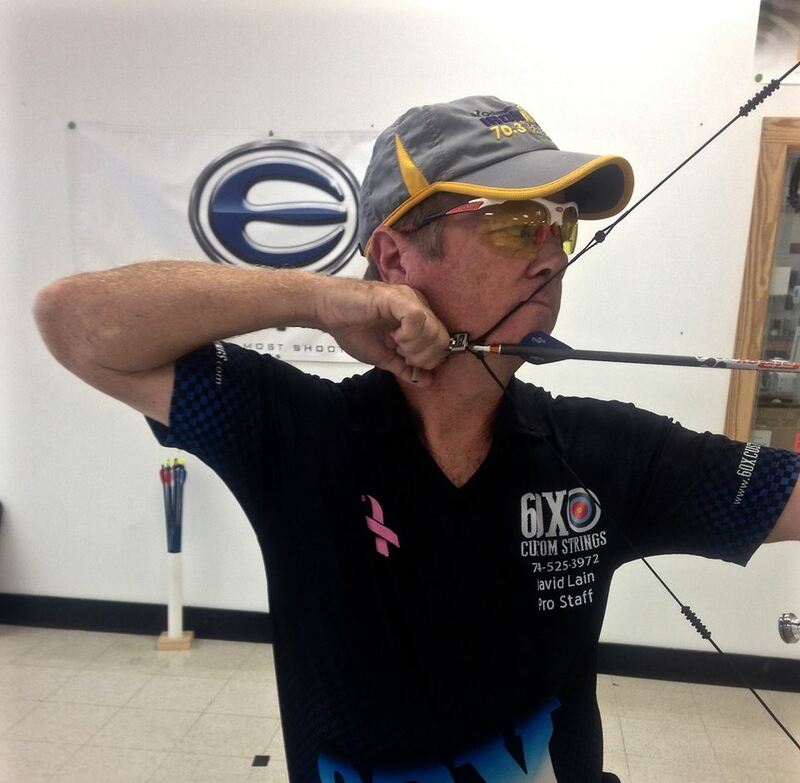 Charlie is a local JOAD Coach and has been involved with archery for decades. We exchanged our “How ya been” and shot side by side for about an hour. Charlie is not a 3D archer having never tried shooting a foam animal. He has, however, a wealth of information and experience at shooting everything else. Charlie is a member of archery / gun club in Chesapeake and invited me to come shoot their field tournaments beginning in May. These are on Sunday where the 3D shoots I compete in around North Carolina are on Saturday. Looks like this will work out just fine except on those weekends I’m racing or shooting out of the region. As far as racing goes, getting into race form is progressing. Today’s training plan called for cycling. Of course, there was the wind. Cycling in heavy wind it is a good idea to go out into the headwind. That’s exactly what I did today. I, also, wanted to start training on my racing bike used for triathlons. Most of the time I train on a less expensive machine. With a race next week it was time to get a feel for the bike I’d not be on in about a year. Let me say, I hammered it into a headwind. I mean I went really hard. Tucked in an aero position, pumping my legs, and pulling for every breath, I ended up with a little vomit in the back of my throat a time or two. I hate those little regurgitations. Yes, I’d eaten a decent lunch, finished it two and a half hours before the ride. Seemed like ample time for the food to have cleared my stomach. Another error in judgment. If you’d ever ridden a bike in an aero position, gone really hard for a long enough time, you more than likely understand that little urp experience. If you haven’t – no great loss. Now, off to the 3D range, where I hope the trees can help block some of the wind. Another bright note – there is no vomiting from exertion in archery. Over decades of competing in cycling, running, and triathlon, I’ve put together a training schedule that works for me. It needed to be time sensitive because I was working – a lot. It also needed to be more sophisticated than go outside and run around until I’d had enough. 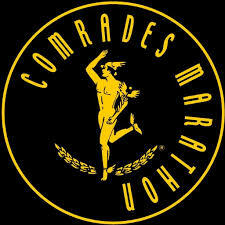 The preparation time I spent on triathlons, cycling and running ranged between 8 hours and 20 hours per week. Since retiring I have replaced “work” with archery on my calendar. Obviously, I can’t shoot all day, but I shoot about 4 hours per day. That leaves me time to train for cycling, running, and triathlons.